Ms. Obama tweeted photo, with caption: "It seems like yesterday that @BarackObama and I were taking our girls to @57thstreetbooks store. Today, I was there with a book of my own. Thanks to everyone who braved the cold and stopped by. #IAmBecoming"
It did not matter to students or local bookstore members that the weather app warned temperatures would drop to the 20s last Sunday. 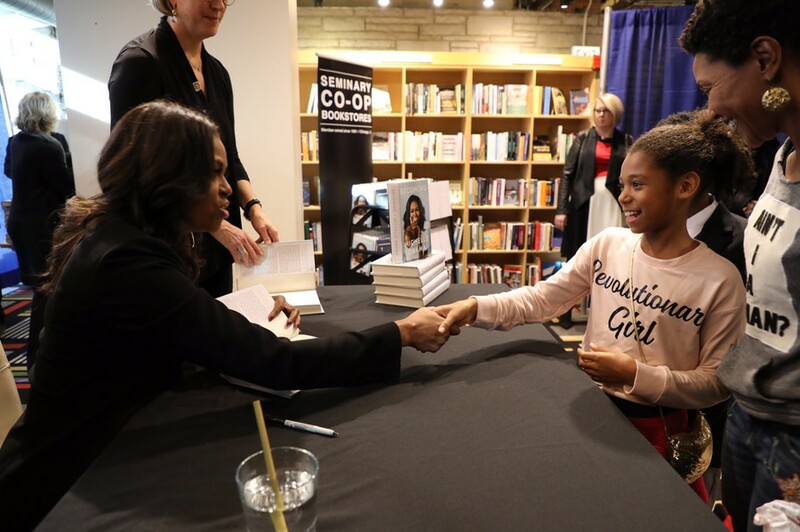 The instant Seminary Co-Op Bookstore announced at 11 a.m. that former First Lady Michelle Obama would be coming to celebrate the release of her memoir Becoming, excited fans—some still in their pajamas—bolted to the bookstore to purchase a ticket. The event sold out completely in a matter of hours, with people buying 500 tickets and 800 books in total. The celebration ended with a countdown to midnight followed by the distribution of the first copies of Becoming. The following afternoon, though the temperature dropped to freezing, people hurriedly rushed their way to the Seminary Co-Op. Anticipation filled the air as the serpentine line snaked around the block; all 500 people gathered in hopes of catching a glimpse of Obama before she entered the bookstore. Seminary Co-Op employees passed around hot cocoa, cider, and coffee as even the two-hour-long wait failed to dampen the spirits of the fans who eagerly anticipated the start of the event. As the time of the event drew closer, the bookstore became a crowded maze of attendees. When the employees announced Obama’s arrival, books immediately thudded back onto the shelves in an almost-rhythmic fashion, and people could barely contain their excitement. Obama made time to meet her youngest fans first, greeting them with a high five and offering them advice, encouraging them to work hard, and to be kind and understanding to their siblings, even when it seemed impossible. She then greeted her older fans with a firm handshake and a warm smile. Although most people had mere seconds to talk to her, she made the most of each conversation. She advised her student fans to study hard and never abandon their dreams. When called a personal hero, she broke out into a huge grin and thanked everyone for their love and support. After meeting Obama, many fans were witnessed wiping tears from their eyes, overcome by emotion, or staring at the book in awe.